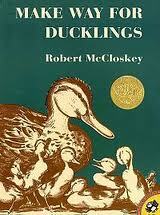 Make Way for Ducklings, by Robert McCloskey, was awarded the 1942 Caldecott Medal. This truly deserving book has been a favorite of families for many years. At the beginning of the book the reader finds Mr. and Mrs. Mallard flying over Boston looking for a place to build a nest for their soon-arriving family. After ruling out many places due to the dangers of foxes, turtles, and traffic, the couple settles onto an island on the Charles River just in time before their eight eggs are laid. Soon after the ducklings are hatched, Mr. Mallard leaves on a journey and agrees to meet the family in a nearby park in a week. Mrs. Mallard quickly teaches her babies what they must know to make the trek to the park, and they set out for the designated meeting spot. As they make their way through downtown, they create quite a stir. Finally they meet again as a family in the park and find a new place to live on an island in the park. 1. “Excellence of execution in the artistic technique employed.” – These pictures are beautifully detailed brown pencil drawings. Artistically, I appreciated the illustrator’s use of perspective and shading. 2. “Excellence of pictorial interpretation of story, theme, or concept.” – The story is very easy to follow visually. The words and pictures fit together very well. 3. “Appropriateness of style of illustration to the story, theme or concept.” – While this criterion was not obvious, I would have to say that it is met. 4. “Delineation of plot, theme, characters, setting, mood or information through the pictures.” All of these characteristics are very clear throughout the story, thanks to the illustrations. I particularly enjoyed the moods evident on the faces of the ducks. 5. “Excellence of presentation in recognition of a child audience.” – My kids love this book and could probably almost quote it to me in its entirety from memory. They like to point out different details with each read.